In this paper, we propose a robust methodology for equity portfolio construction using news-based thematic alphas. In this paper, we propose a robust methodology for equity portfolio construction using newsbased thematic alphas. These alphas are the result of our previous research , where we took advantage of RavenPack´s event taxonomy to build a set of theme-based sentiment indicators. Now, we develop the idea further and combine a large set of thematic alpha streams into an overall equity portfolio. In general, we find that employing our methodology in a long/short strategy yields strong return and turnover improvements, versus treating sentiment as onedimensional, over our 8-year backtesting period, across both region (Europe and US) and size (small, mid, and large market capitalization stocks). The use of a thematic alpha approach allows us to treat each alpha stream individually in terms of holding period, in addition to making use of internal crossing. Together they provide an effective way of reducing turnover. With an average holding period of 2-3 days, our strategy yields Information Ratios of 2.0 for the Russell 1000 and 4.3 for the Russell 2000. For our European equivalent portfolios, the Information Ratios are 2.3 and 3.7. We demonstrate one way to combine alpha streams employing RavenPack data derived from news and social media into portfolios that deliver strong risk-adjusted returns and lower turnover than most news-based portfolios. Not only were we able to extract strong performances from our separate regional and market capitalization-based portfolios, but we also found low correlations between these portfolios so we could harvest the benefits of diversification by combining them. A portfolio combining all sizes/regions delivered an information ratio of 6.0 vs the best separate IR (US small cap) of 4.35. A cross-regional small cap portfolio yielded an IR of 5.36 vs 4.35 for the US and 3.73 for Europe. A US portfolio combining all market caps gave an IR of 4.37 vs 4.35 for US small caps and 2.0 for large/mid-cap. A European portfolio of all sizes had an IR of 4.44 against 3.73 and 2.58 for EU small and mid/large caps, respectively. We separate out sentiment for different corporate event groups - earnings, M&A, and analyst ratings being examples. This has delivered improved results for equity portfolios we construct - not just in terms of returns, but also increased diversification and lower turnover. This thematic, or alpha stream, approach differs to one of our legacy tactics where we aggregated sentiment across all event types - one dimensional and perhaps leading to too much smoothing. The concept of alpha streams is very well known in the investment community, and there has been a fair bit of research into combining alpha streams, but little research exists on the actual alpha creation. Such know-how is usually kept secret by portfolio managers to maintain their edge. We start by creating daily sentiment indicators for each stock by event group. That is followed by creating the alpha streams using the 33 different event groups, 10 possible holding periods (1 to 10 days) and 6 potential strategies as per table 1. We then eliminate streams that do not have statistically significant returns. The Information Ratios of the remaining alpha streams are used to calculate their relative weights and then after some internal crossing of the constituents we have the weights of each stock in our portfolio. As part of our analysis, we explored different temporal windows for the calculation of our Information Ratios, in addition to varying the holding period and the technique used to manage the holding period. The optimal holding period, after the inclusion of transaction costs, is around 5-6 days. It is shorter pre-costs. A small number of event groups contribute most to the portfolio performance, particularly analyst ratings - though this does vary by size and region. With an average holding period of 2-3 days, our strategy yields Information Ratios of 2.0 for the US Russell 1000 and 4.3 for the Russell 2000. For our European equivalent portfolios, the Information Ratios are 2.3 and 3.7. Both our regional and size portfolios hold surprisingly low correlation, and hence additional diversification benefits can be archived by combining the four portfolios into an overall “super-alpha” - with an Information Ratio of 6.0 before trading costs (see figure below). The emergence of “big data” in finance, as a result of technological advances in storage and processing power, means portfolio managers have become, or employed, data scientists to deal with not only thousands, but potentially millions of alpha streams within a portfolio. In this study, we try to achieve the benefits of an alpha stream approach to using sentiment data. Besides the obvious diversification improvements, turnover can be significantly reduced as long as alpha streams can be crossed internally on the same alpha platform, assuming they are “nottoo-correlated”. This is as opposed to considering sentiment as a one-dimensional signal. Our recent research focus has been into the non-uniformity of price reaction to different corporate events reported in the news. Our last paper described a methodology to create thematic alpha streams based on RavenPack News Analytics corporate event groups. We analyzed these alphas as stand-alone signals, showing promising results. This paper takes this concept forward to present a simple yet robust framework to portfolio construction from the different alpha streams. We consider an alpha stream to be a time series of returns representing the outcome of a particular trading strategy. As such, an alpha stream can be constructed by combining individual securities into a synthetic asset – with full constituent level visibility – with the benefit of being able to reduce turnover through internal crossing among the alpha streams that conform the final portfolio or “super-alpha”. Our methodology relies on a simple combination-rule based on the historical Information Ratio of the alpha streams. 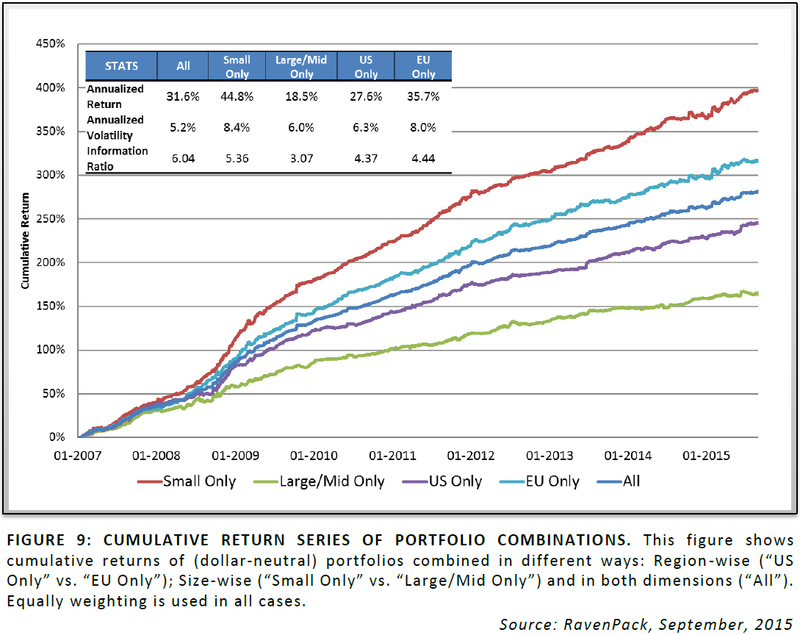 We show that the constructed portfolios provide attractive performance across different universes. Besides, thanks to its simplicity, we avoid the common problems of optimization methods (collinearity), making the framework robust and easily scalable. In the paper, Section 2 describes the generation of our building blocks - thematic alpha streams using sentiment of corporate news, Section 3 describes the framework to construct portfolios using these alphas, Section 4 looks into the behavior of different portfolios in regard to holding periods and theme contribution, Section 5 shows the main results across the universes under study, and finally, Section 6 summarizes the key conclusions. I agree to RavenPack's Terms & Conditions.